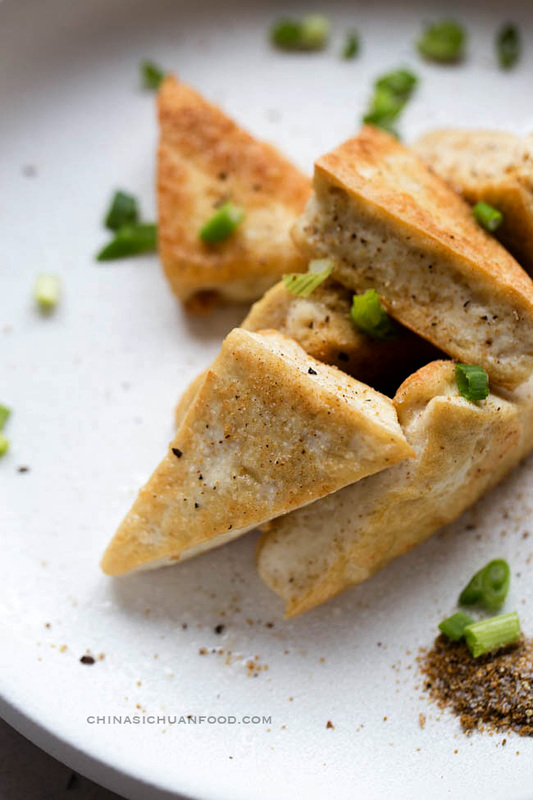 How to make easy and crisp outside, soft insides Chinese salt and pepper tofu. Tofu is believed to be healthy and tasteless and it is so hard to cook. But you cannot image how Chinese loves tofu and how many ways to cook tofu in Chinese cuisine. 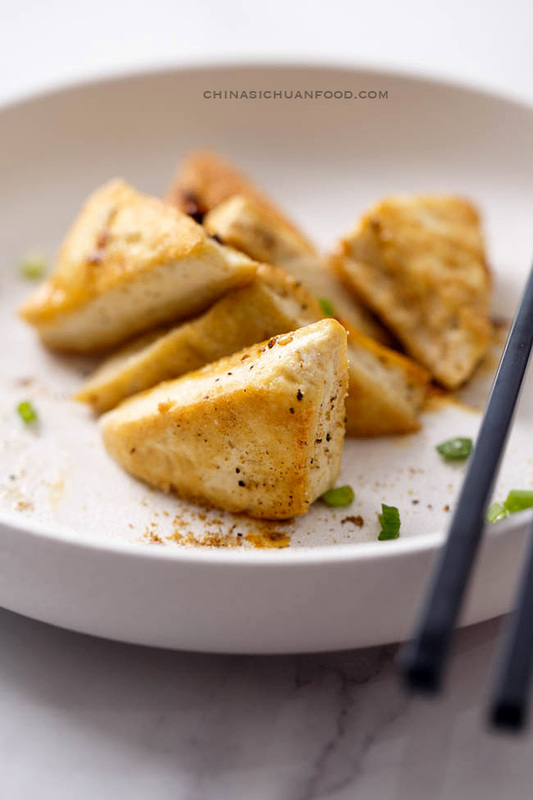 This is the simplest one — pan-fried crispy tofu with salt and pepper. Chinese salt and pepper is slightly different from the familiar salt and ground pepper. Instead we use Sichuan peppercorn and salt. Salt and Sichuan pepper is one of the most popular and famous Sichuan style mixed spice. But you can use any other mixed spices and mix it with salt. For those who want a slightly hotter version, use pepper flakes or chili oil. 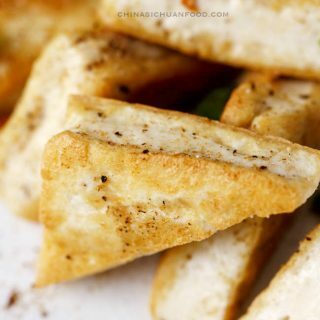 I recommend using firm tofu to make salt and pepper tofu. 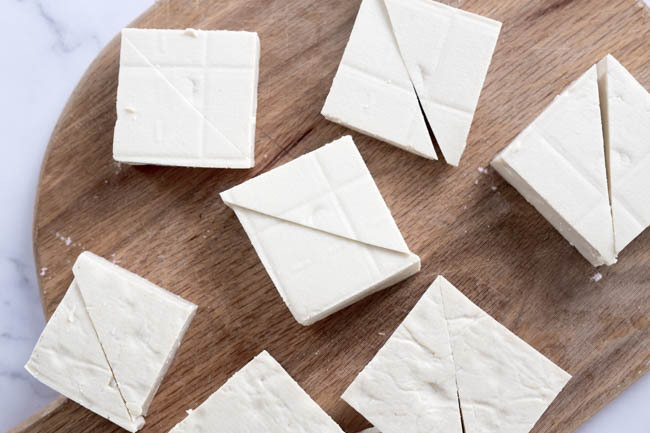 If you get a tofu block with more water content like soft tofu, use a weight to press the block and remove extra water. Firm tofu are not so fragile and we can keep a better shape. Additionally, the tofu slice will not collapse after pan-frying due to the less water lost. 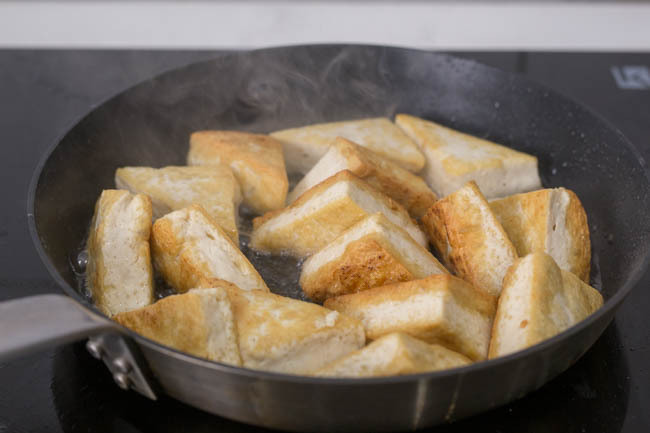 In order to get a crispy outside and soft inside pan-fried tofu, the tofu slices should be cut thicker. Possibly around 2cm thick. 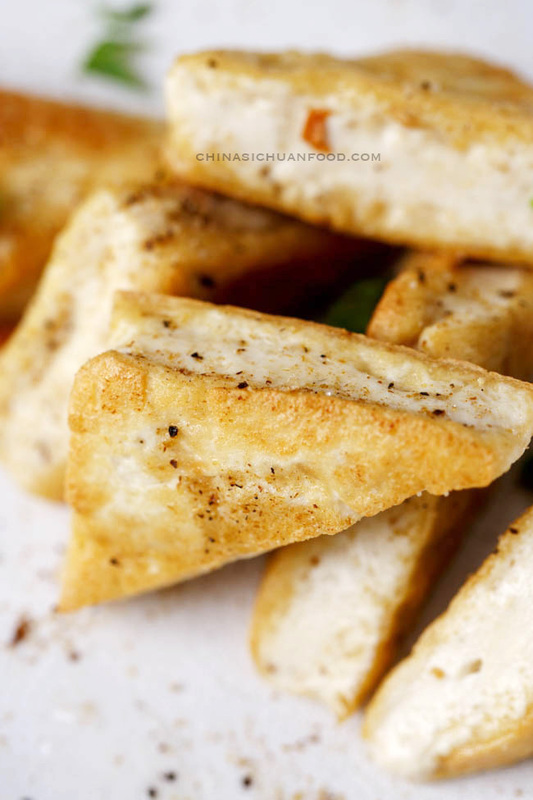 Thicker tofu slices can form a very good crispy and soft comparison and prevent taste too dry. I recommend using 1 tsp. Sichuan peppercorn powder or black pepper + 1 tsp cumin powder + 1 tsp. salt to mix a dry salt and spice mix. Cumin powder will make the taste very unique. 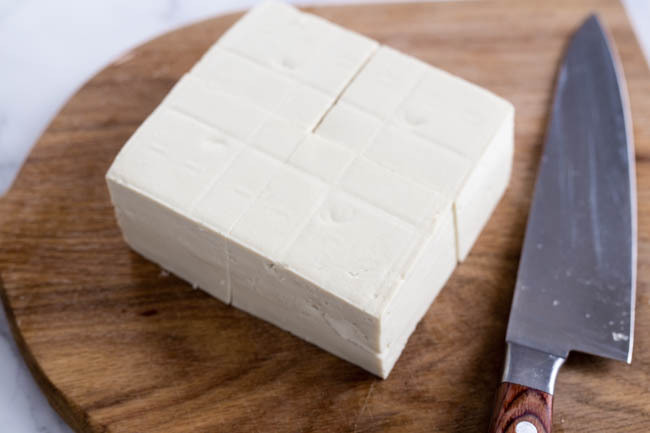 Cut the regular firm tofu into thick slices (around 2 cm in thickness). And mix salt and spices together. Heat up cooking oil in pan. Put the tofu slices in. Let them stay for a while until the one side becomes golden and then turn over the fry the other side. Edges can be fried too. Turn the fire off, discard extra oil. Option 1: add salt and pepper and toasted until each piece is well coated. Option 2. place the tofu slices in serving plate and then sprinkle green onion, salt and pepper evenly. Place the remaining on one side of the serving plate, working as a dry dip. 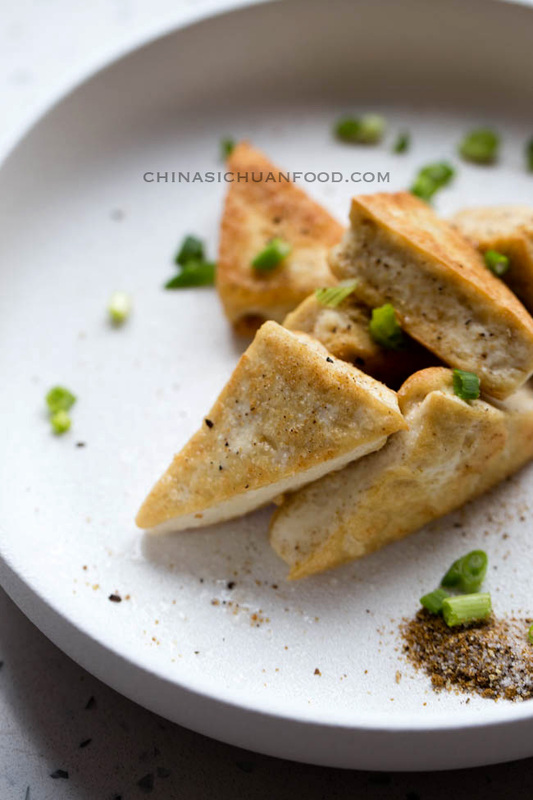 Sichuan pepper and salt tofu. Excellent vegan recipe. Two versions introduced. Cut the regular firm tofu into thick slices (around 2 cm in thickness). Mix salt with spices. Heat up cooking oil in pan. Put the tofu in to fry until one side becomes golden (Let them stay for a while). Turn over and fry the other side. If you get thick slices, slightly fry the edges. Turn the fire off, discard extra oil. Option 1: add salt and pepper and toasted until each piece is well coated. Option 2.:place the tofu slices in serving plate and then sprinkle green onion, salt and pepper evenly. Place the remaining on one side of the serving plate, working as a dry dip.